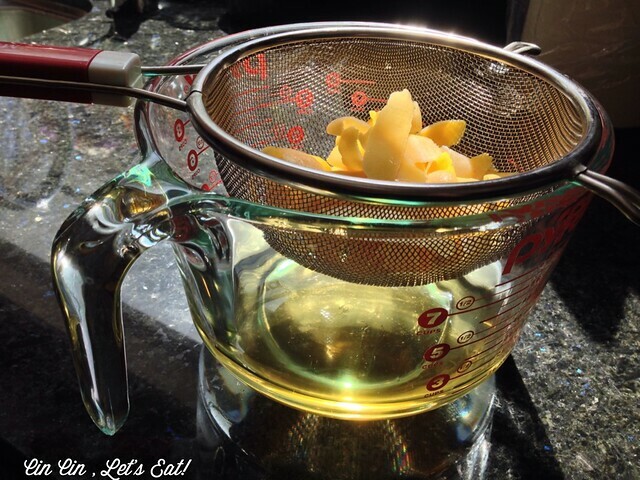 Limoncello [recipe] – Cin Cin, Let's Eat! There are tons of simple pleasures in life. Sipping on iced cold limoncello on the porch after a decadent dinner is a great example! During our short travel in Italy, almost every night ended with a nice glass of iced cold grappa or limoncello made by the chef’s mom or grandma. We enjoyed the refreshing digestif while people-watching and exchanging fun life stories. I looked up recipes to make my own batch once we returned home, yet our Meyer lemon tree hasn’t been cooperative. It is still in shock from our massive home remodeling a few years back and have been making a comeback very slowly, yielding very little fruit. As I slowly tested various recipes and measurements, I think I finally made a batch that I loved. 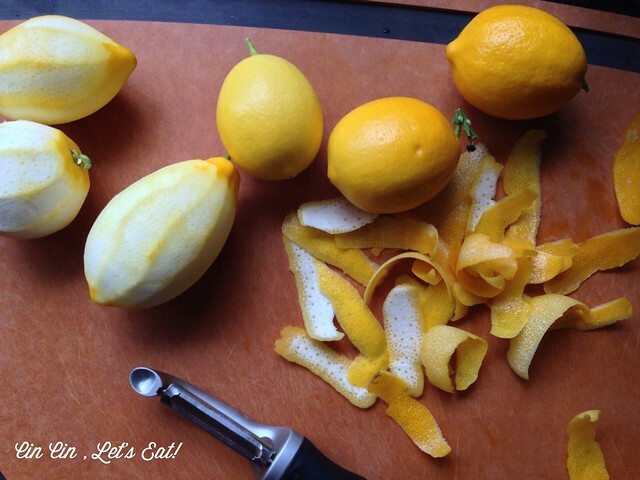 Any varieties of lemon will work, I used Meyer lemon because I like its distinct flavor. Also traditional limoncello calls for grain alcohol but I used vodka in all the batches. 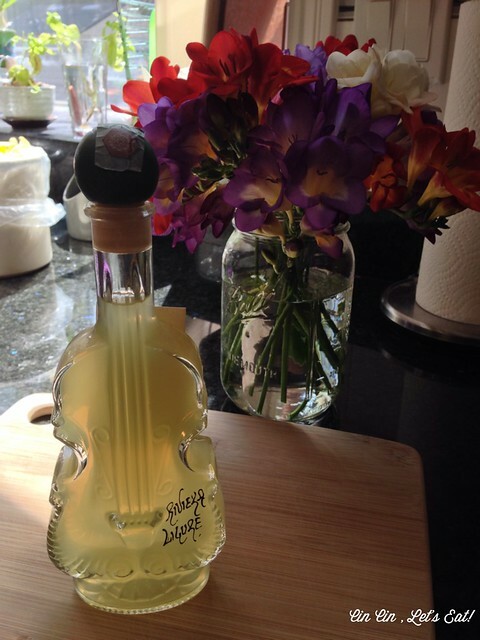 cute souvenir – A bottle of limoncello in the shape of a “cello”. Wash, clean, and dry the lemons thorougly. 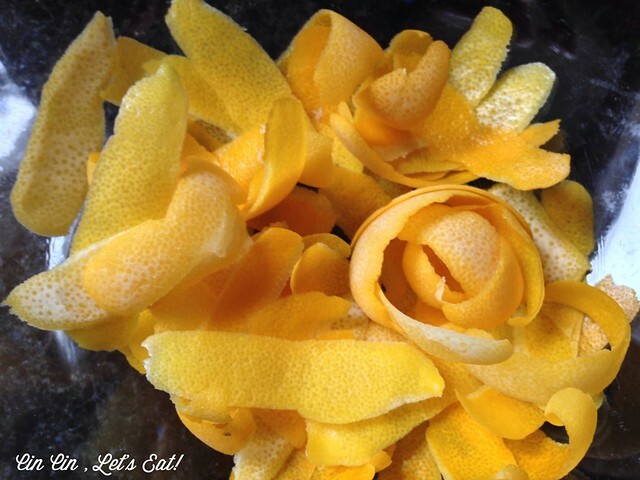 Using a vegetable peeler, peel the lemons in strips. 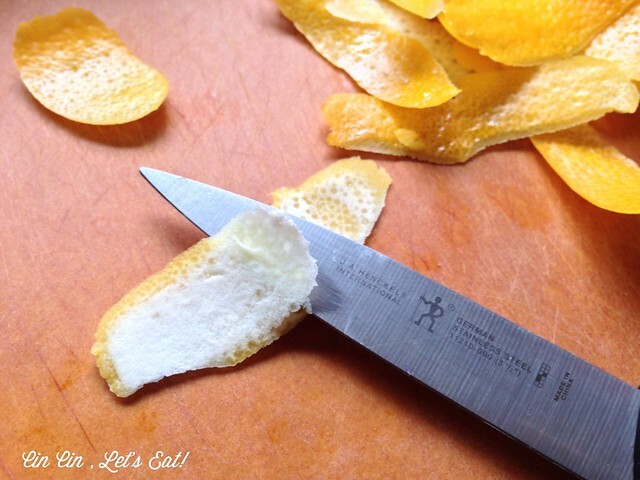 Use a pairing knife and remove the white pith from the lemon peels. 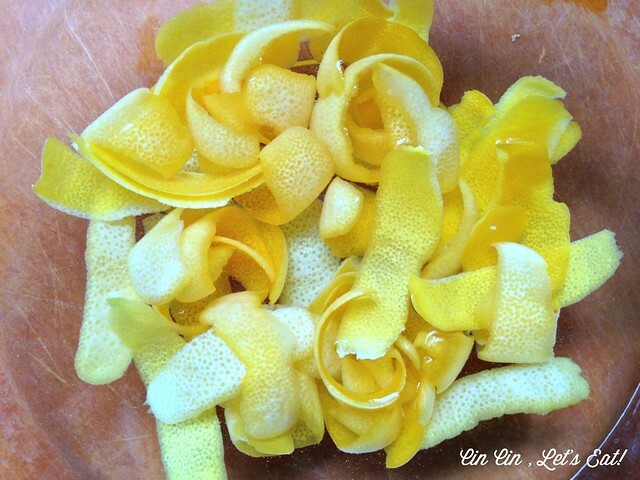 Place all the pith-free peels into a large non-reactive (glass or ceramic) bowl. Add two cups of vodka into the large bowl with the lemon peels. Cover the bowl with plastic wrap and store it in a cool and dark place for 4 weeks. Be patient! And if you are forgetful like me, mark the 4-week date on your calendar to remind you. After 4 weeks, strain the vodka through a fine mesh sieve into a large glass bowl, press down on the peels to extract all the liquid, discard the peels. To make simple syrup, heat up 1.5 cup sugar with 2 cups of water until the sugar is thoroughly dissolved, about 3-4 minutes. Let the simple syrup cool down and add 1.5 cups of syrup to the vodka. Personally I like the sweetness with 1.5 cups of syrup. If you prefer even sweeter, add 2 Tbsp of syrup at a time until satisfied. 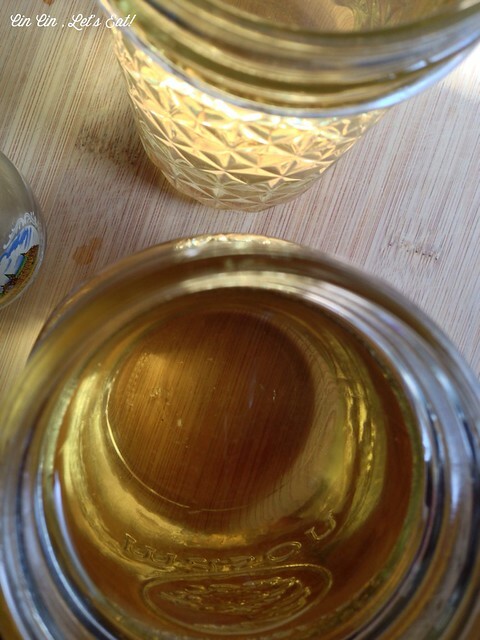 Transfer the limoncello into airtight jars and bottles, store them in the freezer and enjoy whenever! remove all the white pith or the limoncello will be bitter. 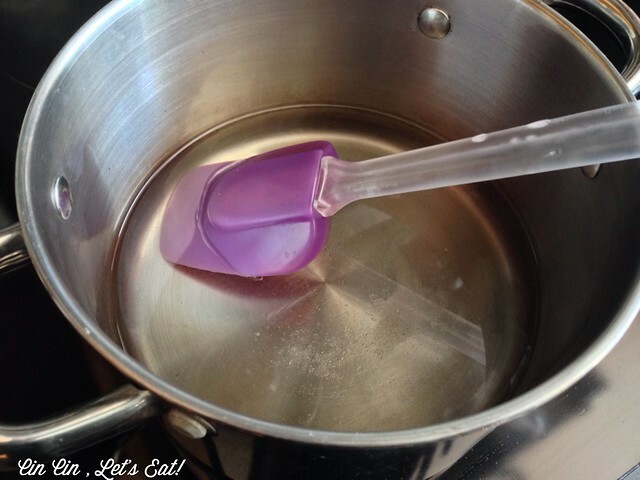 making simple syrup. Any extras you have will be great for sweetening cocktails. After one month of waiting, it’s time! 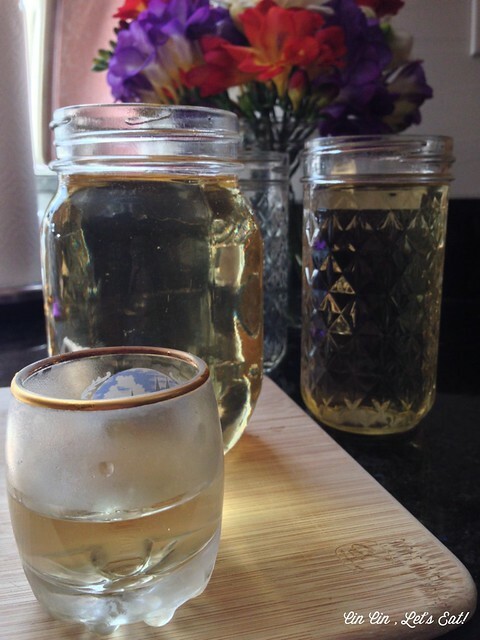 Pingback: Blueberry Basil Limoncello Cocktail [recipe] | Cin Cin, Let's Eat!